The village of Coram's halcyon days began in 1790 and ended in 1884. During this period it was the seat of Brookhaven Town government. In 1790, the town decided to move the site of government from Setauket to Coram to provide a more convenient central location for the voters. The mode of government was the annual town meeting held in April. Here office holders were elected, issues of the day voted on. In addition meetings of the official boards of the town met in the Davis house after 1800. Probably the first meetings were in the Coram Baptist Church; around 1800 the tavern-inn of Goldsmith Davis was chosen. The Town Meeting was held at this building some 80 times until 1885 when the Town was divided into election districts. The original owner of the house was probably Elijah Davis (1727-1802) who kept a tavern-inn. He was succeeded by his son, Goldsmith Davis (1756-1825) who was, it is said, hung upside down in a well during the Revolution by the British for refusing to divulge military information. The inn was a Temperance House in the mid 1800's. By 1890 all commercial use ceased and it became solely a private residence. From 1812 to 1840, the Davis House served as a base for a horse artillery company for the State Militia, which was a mobile force for the defense of Suffolk County. In addition, the house was used for regular meetings of militia officers due to its central location in the county. The host of the inn, Captain Lester H. Davis (1807-1886) was the officer in charge for many years. 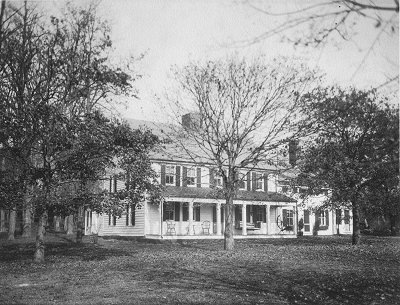 (1926-), the seventh and final generation of Davises to own this house, sold the house to the Town of Brookhaven in 1999. Mr. Davis sold the house and 3/4 acres of land to the Town for $300,000 along with zoning concessions on other land that he owned. The Town later purchased the nearby plot of land that the Davis family cemetery is located on. For a view of the layout of the land that the house is on (two plots) as well as the land the cemetery is on (one plot), click here. The Davises have been active participants in local politics, and as was the practice, used their homes as offices. They have held a wide variety of Brookhaven Town positions: Town Board member, and Suffolk County Treasurer. On April 15, 1986, the Brookhaven Town Board designated the Davis Town Meeting House in Coram as an official town landmark, citing it as one of the town's most historic structures.